My Top 12 Baby Essentials! My little man Beckham will be one year old this month. Its so not fair. He was born 3 months early, so he is still my little baby. He has mastered the skill of crawling and is now saying “mama” “dada” and “baba.” We are so proud of our little miracle, he is our hero! 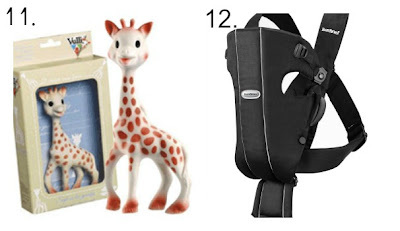 In honor of his birthday coming up, I thought id share my top 10 baby items. Most of these, I will never leave the house without. I hope you guys enjoy, and that this helps any new mama’s out there struggling to find the right baby items. Pros: I am OBSESSED with my stroller. As some of you might know, my kids are 18 months apart. Having two kids under two can be challenging, but this stroller has been a life saver. We looked at tons of other options, and the one thing I hated most with other double strollers, was the seats that sat underneath the other. For instance the Phil and Ted Dot, GREAT stroller, but so not practical for my situation. I could just imaging Cayman or Beckham constantly kicking the other in the back, or one of them going crazy because they couldn’t see anything but the back of a seat. What I like most about my City Select, is that it is so versatile. My boys can sit facing each other, facing away, both facing me, both facing away from me. It is insane how many options it has, and how perfect it is for kids close in age. I also love the amount of storage space, and how smooth the ride it. Another great thing about this stroller is that it is not wide, and is not too long. It moves like a single stroller, fits through all doorways, and doesn’t feel like you are trying to move a bus. I can drink a diet coke, and push my stroller one handed at the same time. Did I mention the storage space? I take my stroller grocery shopping and just put the food at the bottom. LOL Yep, its that amazing. Here’s a little video if you are interested in learning more about this amazing stroller!! Cons: The only cons I can think of is the price. That’s a big one. 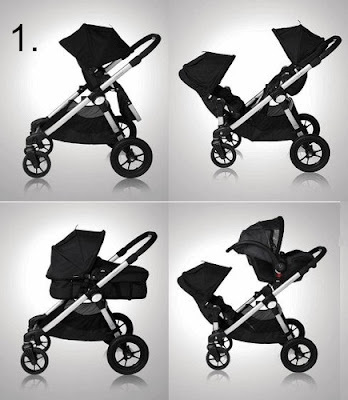 The stroller itself is a pretty penny , and that is not including the doubles kit! Everything comes separate. The tray table, drink holders, everything. It’s kind of a pain. I also do not like that the stroller will not fold flat if the second seat is attached. You can close the stroller with one seat attached just fine. When the second seats attached, it does not fold flat at all. Besides that, I think this stroller is a million times worth it. I absolutely love my stroller! Pros: I love my diaper bag, and that it doesn’t actually look like a diaper bag. Ive had mine for almost 3 years, and I still get compliments on it! It has tons of storage space and pockets for cell phone, 2 bottles, 1 front, and 2 easy reach & grab pockets. It also has a fold out diaper changing pad and matching diaper wipe case. This diaper bag was totally worth every penny. Pros: Some say that bottles do not make a difference on whether or not your baby has gas. Well, I beg to differ. While Beckham was in the hospital, he would start spitting up his milk because he had so many air bubbles. Even if I burped him right away. 🙁 I brought my supply of Dr Brown’s bottles to the NICU, and he stopped spitting up as much. Pros: Oh gosh, I could go on and on about these. They are soft, breathable, and the perfect blankets for swaddling. Beckham is 8 months corrected, and still falls asleep when I swaddle him in these blankets after a warm bath. Pros: If you are a germ freak like me, you will love these. They are safe for babies, and smell delightful! I do not leave the house without these. Pros: I love California Baby, because their shampoo and bubble bath have calming essential oil blends that put my babies right to sleep! I am one of “those” moms that bathes her kids twice a day, so having good bath essentials is a must for me. They are also organic, which I love. Pros: Beckham is learning how to feed himself, and puffs are his favorite. I stock up on these every time I make a trip to babies r us, or BuyBuy Baby. They taste yummy (yes i’ve tried them) and they are organic. So I don’t worry about all those stupid GMO’s and nasty chemicals they put in food these days. Cons: Cayman likes to steal them, and also likes to dump them all out on the floor. Yes, that happened today. Pros: I am the queen of losing pacifiers, so when i got this little guy it was a life saver. Beckham loves it because its so soft and plush, and I like it because I can always find it. Win, win! Pros: I love these because they are perfect for our on the go lifestyle. I spoon-feed Beckham every day, but when I’m on the go these are awesome. Just squeeze them, and feed the baby. Easy peasy. Plus, they are organic and easy to throw in your diaper bag. No spoon required. Pros: Man is this carrier amazing. I have this crappy carrier I bought after I had Cayman. I was naive and thought all baby carriers were the same. Boy was I wrong. Beckham likes to be held 24/7, and there were days I had to carry him in his carrier ALL. DAY. LONG! It got to the point where I couldn’t sleep at night, because my back hurt so bad. I mentioned it to a lady in my ward, and she brought over her baby bjorn for me to borrow. All her munchkins had grown out of it. It has made such a difference, and my back doesn’t hurt when I wear it. It distributes the weight evening, and my little man loves it! I would definitely recommend this carrier to anyone.